"Everything there ever was, was once just a dream"
Taking a new concept to reality requires vision, know how, money and hard work. If we never acted on our dreams human kind would not even have fire and the club. Fortunately we do act and our standard of living gets better as a result. Development of new aircraft is part of this process. As we constructed components, detailed design decisions were made as we went. Soon word leaked out that we were building a 4-place EZ type that aroused many naysayers as well as constructive help. Ted Yon, EAA since 1954, senior aerospace engineer, played the most important role advising on rigging and structures. Ted, who is now also a FAA designated engineer, did the span loading and resulting spar cap lay-up calculations as well as our Wiffle Tree design. The scratch-built prototype flew in August of the same year. This pretty little #1 Velocity exceeded all our expectations. The aerodynamic engineering had been very basic but experience, intuition, luck and stubbornness paid off. I then built the kit molds and started up production. While away from the factory, I built my own personal Velocity that served faithfully for years. With my own aircraft and bush pilot past I was able to push the low-speed end of the envelope marveling at the Velocity's stable, stall-proof characteristics. The Velocity was the first modern kit that had utility, style, speed but most important of all it was relatively easy to build. The reason for this was that Dan and I used our prior boat building experience to modularize the components. This integration of many parts into just a few big ones produced the industries first true "fast built" kit. This was done by design such that less assembly was required as the parts came from the mold not because of factory post molding sub-assemblies. As the Velocity became more popular the need for a better method of wing fabrication became obvious so I formed Dynamic Wing Company and started the evolution of my new solid core pressure molding. Like the Velocity itself, the closed molding system my team and I perfected worked better than anticipated. We have since delivered over 180 complete sets of wings to very happy customers. This is the culmination of over 30 years of aerodynamic and composite study and experimentation on my part. My curiosity in these areas started at a young age. 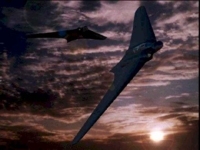 In 1962 when I was 12, I built a gas powered flying wing of my own design that provided many hours of fun. That same summer I built my first surfboard that was also a lot of fun until a big wave broke it in half. This was just the beginning of my lessons in structural engineering. At 8 years of age I won the first sail boat race I entered. At 16 I won the first surfing contest I entered and at 18 I supervised the hull design and lay-up, helping my older brother win the Bahamas 500 off-shore powerboat race. In the late 60's I started using epoxies and multiple fins on my surfboard designs. I had a garage at the time and went through a period of rapid development in board shaping. I have since seen many of my ideas become the standard. While in ocean engineering school, I developed my own hydrofoil design that was later adapted to carbon fiber wind surfers I had made. This challenging development in fluid dynamics and structures I've always done as a competitive hobby with no commercial intent. My full-scale aircraft experience didn't come about until I was in my twenties. I had a P-18 and later bought the first 540 Lycoming Powered Maule and flew it down to Costa Rica to run our ranch. I used that plane as a real workhorse and gained an understanding of low speed flight and stall characteristics. When I returned in '79 I went to Oshkosh, camped out of my Maule, and had my eyes opened up to an entire world of possibilities where I could use my design and composite skills to do something that I love. The Atlantica is a relatively recent development for me with it's roots starting at Sun N' Fun '97. I had my pressure molded wings on display with some models of my slide-rule designed aircraft in front. A fellow stopped by to talk design. He turned out to be a top-level military aerodynamic engineer from Wright Pat. He was unable to give up "secrets" but showed interest in my highly integrated wing molding process. Later on, he dropped by a second time and pointed out that my process lent itself to easy construction of some emerging designs. In 1998, I met Austin Meyer, a young aeronautical and computer whiz who had developed an intriguing software package using Open GL in order to provide extremely realistic simulations. 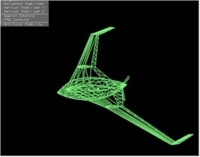 The program, X-plane is based on blade element analysis and calculates moments to a high resolution in real time (at least 15 times per second). The graphics interface of X-Plane makes it appear to most people as a simple flight simulator game but it is based on real engineering and I immediately saw its potential as a concept design tool. What evolved resembled a bird by the time performance and handling had been optimized. This fairly conventional design had great numbers and style, but as I studied closely how to produce my "x-bird" its complexity of manufacture and high parts count became glaringly evident. In Dec '98 I remembered that nice man from Wright Patterson and the BWB that had "pitch generating capability". I knew it would be easy to build, especially with my proprietary Pressure Molding Process, but how would I make it fly right? This sent me off researching for what BWB's really looked like. 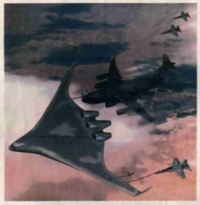 By 1944 the Horten brothers' flying wing HO-9 had advanced into a partial BWB with some very important rigging and control features. Critical details that are essential to stability. The next place I went was NASA, which led me to Dr. Ilan Kroo's work at Stanford University. Then I took a closer look at the many renditions of future military designs discussed in "Aviation Week" and other resources. With a refreshed understanding of the BWB as compared with Flying Wing designs, I returned to a component of X-Plane, called "Plane-Maker . This allows the user to create an aerodynamic model of anything imaginable (pretty much) and fly it in the real-time simulation of X-Plane. The results of entering a BWB configuration were immediate and dramatic. 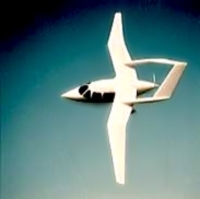 By the time Sun N'Fun came around, I had several models of personal BWB's that out-flew any of my previous designs. Then with my notebook PC and X-Plane, I was able to show these designs - in flight - to many old friends. It was very exciting but their reactions were skeptical. I found myself reminding them that the math hadn't changed. "X-Plane replaces all of the pencil pushing that 'slide-rule' designers labored over for months in order to understand a new shape, only in real-time." At this point I had over a year's experience with the program and a good rapport with it's author developed over long conversations regarding the accuracy of the program. The "control" aircraft that came with the program, like the 172, Baron etc. all fly correctly as personal experience has shown me. The program and blade element analysis provide very realistic output, including failure modes, and gusty weather situations. Likewise, my own designs always reacted to changes in a logical manner. It is more accurate than scale models, and has advanced the design process beyond any point that I expected to experience or had available when I helped build the first Velocity. Later in '99 I started using Dr. Hanley's "Visual Foil" software to find the correct airfoils to further optimize my Personal BWB designs. First I analyzed the Reynolds numbers for sections across the span. Then I used this information in conjunction with my specific rigging requirements to search for the proper airfoils for each station on the Z-axis. In the software's library of over one thousand airfoils I was not able to find any that provided docile characteristics, laminar flow and allowance for efficient rigging at the same time. As a result I had to design my own new family of airfoils to do the trick. Once the airfoils were complete, I went back to my old fashioned drawing board with a pencil and worked out the internal details. This includes ergonomics, mechanics and structures. 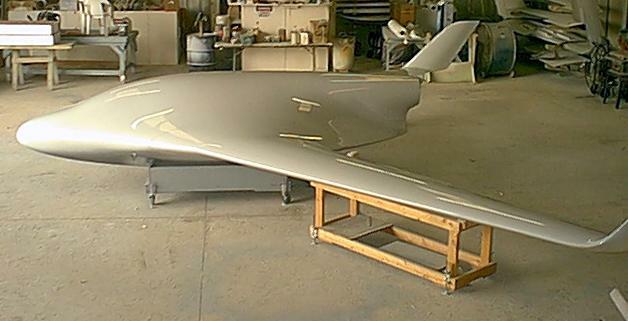 The BWB shape really lends itself to the plumbing and hardware space requirements of an aircraft. The cabin is free of a center tunnel, and still has 10cu ft. of cargo with room for skis or a long surfboard. Finally I was able to plot some full sized templates for the mold masters. The technique I use to make these forms is just a jumbo version of what a professional surfboard shaper taught me in 1966. I take foam blocks, cut them, and shape bevels before rounding. The system is very accurate and fast for someone like myself who has shaped hundreds of surfboards.